The Seminoles return just four defensive players after safety Derwin James left early for the NFL draft. TALLAHASSEE, Fla. (AP) — Harlon Barnett wasn’t looking for a job when Florida State knocked on his door. He was happy coaching at his alma mater, Michigan State. Life was good, especially after the Spartans bounced back from a 3-9 season in 2016 to a 10-3 mark last year. But just minutes after a Holiday Bowl win over Washington State, Barnett got a text from an old friend. It wasn’t a congratulatory text, it was about a job interview. Barnett’s celebration turned to curiosity as he read the message from an old coaching friend, Raymond Woodie, who had joined coach Willie Taggart’s staff at Florida State. The text set the wheels in motion for Barnett, a seven-year NFL veteran who said he prayed for days on whether he should leave Michigan State. It also meant ending a 14-year association with Mark Dantonio dating back to when Dantonio hired him at Cincinnati in 2004 and then at Michigan State in 2007. Barnett’s defenses have traditionally been among the nation’s best — Michigan State was No. 7 in the Football Bowl Subdivision in total defense (297.6 yards per game) in 2017. In the end, Barnett felt the chance to have full control of the Florida State defense was too good to pass up. 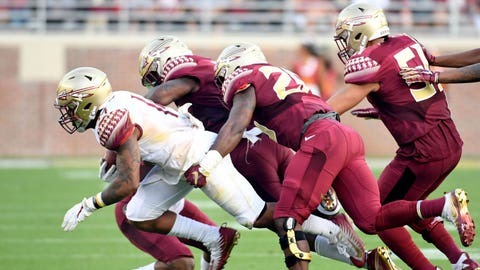 Florida State’s defense isn’t a rebuilding job but it challenge Barnett’s abilities. The Seminoles return just four defensive players after safety Derwin James left early for the NFL draft. While Florida State allowed just 21 points per game in 2017, there were late-game defensive breakdowns that contributed to losses to North Carolina State, Louisville and Miami as well as a crushing 35-3 defeat at Boston College. Taggart has brought a different vibe to Florida State, sparking enthusiasm for the opener against Virginia Tech on Sept. 3 with his “Lethal Simplicity” by implementing a no-huddle offense. But luring Barnett to Tallahassee is as vital as any move he has made. Barnett inherits a group loaded with talent — led by defensive end Brian Burns, defensive tackle Demarcus Christmas and cornerback Levonta Taylor — but also questions about who will step in at linebacker after losing three seniors. His defensive scheme is also pretty simple, focusing on an attacking four-man defensive front and letting corners play man-to-man. Players have embraced the new scheme, which they feel frees them up to use their natural ability and go off instincts. The Seminoles return to a 4-3 defense after four seasons of running a 3-4 under previous coordinator Charles Kelly. The 51-year old Barnett has played for Bill Belichick, Bill Parcells, Dennis Green and Tony Dungy. He joined Nick Saban’s staff at LSU as a graduate assistant in 2003. Saban and Barnett’s relationship goes back 27 years to when Saban was Cleveland’s defensive coordinator. Barnett has never had full control of the defense before, even after more than a decade at Michigan State under Dantonio. But Barnett is widely respected for his positive attitude as well as his nasty defenses.